I adapted this recipe from this Lime Cream Cheese Pound Cake recipe. 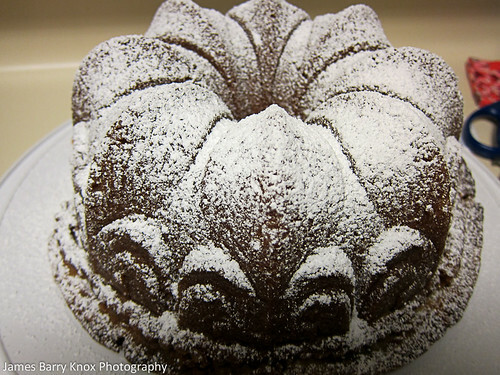 The 10 cup Fleur-de-Lis cake bundt pan makes for a lovely presentation but the 12 cup bundt will hold all the batter. I used 3 sticks of butter instead of 2 1/4 sticks. I also doubled the amount of sugar and lemon juice for the glaze because I am a little heavy handed with my brush. With an electric mixer, fitted with a flat beater, beat butter and cream cheese at medium speed until creamy and smooth, about 30-40 seconds. Add 3 cups of the sugar and beat until light and fluffy, about 5 minutes, stop mixer and scrape bowl occasionally. Add eggs, 1 at a time, beating well after each addition. Beat in vanilla and 3 tbsp. lemon juice (or regular fresh lemon juice). Reduce speed to low. Fold in flour, baking soda, and salt mixture in 3 additions, blending each addition just until smooth, stop mixer and scrape bowl occasionally. Fold in lemon zest. In a small bowl, whisk 1/2 cup fresh lemon juice and 1 1/2 cups sugar until blended. Set rack over a sheet of waxed paper, Generously brush cooled cake with glaze. After glaze has set; approximately 10 minutes, lightly sprinkle cake with confectioners’ sugar. You are currently reading Lemon Cream Cheese Pound Cake at Simply J Life.